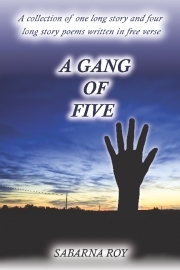 Description of "A Gang of Five"
A Gang of Five is a collection consisting of one long story and four long poems. The work delightfully bridges the gap between the mundane and arcane writings of today and provides an interesting yet intellectually stimulating treat for the discerning reader. New Life is a long story written from the perspective of a successful adult whose mother had deserted the family for another man. The teenage angst and the scars it has lost behind on the psyche of the protagonist are subtly reflected in the character. The different elements and characters of the story are beautifully interwoven to produce an intense and compelling story of an adult haunted by the trauma of being deserted by his mother. The work is interspersed with thought provoking views on issues like love and socio-economic conditions in India. Unshackled by the bonds of traditional rhyme and metre the free verses evoke the stark reality of urban life, hitting you straight in the guts. The use of everyday urban imagery adds to the appeal of the compositions. The concrete prison of modern urban life and the unfulfilled desire to escape to a simple life is aptly brought out in The Tower. The other poems of the collection are more biographical in nature and the free verses sketch out life stories of three women with its attendant pathos, poignancy and logic. Sabarna Roy (43) is a qualified Civil Engineer from Jadavpur University, Kolkata. He works in a senior management position in a manufacturing and engineering construction company. He is widely traveled in India and lives in Kolkata with his son. He is an avid reader and movie buff. He started writing during his University days: mostly English and Bengali poems. He stopped writing after he had left University and joined work. After a gap of 19 years he started writing once again mostly to reconnect with himself. In the period of 19 years when he did not write, he spent his non-working hours reading, listening to music and watching world cinema. He loves reading Tolstoy, Chekov, Rabindranath, Eliot, Manik Bandopadhyay, Satyajit Ray, Kundera and Pamuk the most. He is hooked onto Mozart, Turkish and Egyptian music and M.S.Subbalaxmi. In cinema his favorites are, Aparajito; Pratidwandi; Rashoman; Eight and a Half; Breathless; Head-on; Birds; Vertigo; Sunset Boulevard; Sacrifice; Garam Hawa and Tare Zameen Par. Reviews of "A Gang of Five"
New Life: A very interesting story which advances with a smooth pace,though it gets preachy in parts.The metaphors used are very appropriate and interesting.The image of the mother is very carefully drawn,which i like.Overall,its an unusual mode of presenting a familiar plot. As for the poems,all i can say(without exaggeration) is I haven't read such great story poems! My personal favorite is Tara.It has a peculiar rhythm about it that makes it enigmatic.I loved it. Having read his earlier masterpieces: '9Lives...' and 'Mainak and I' , I am a tad disappointed with 'A Gang...' ..The 'storyteller' makes a better poet.! I particularly liked 'The Tower'. 'New life' tends to get lost as it meanders through the author's observation and the storyline, at times the contrast is too stark and the link between the two seems missing. The insights into the human psyche, Sabarna's strongpoint, amply demonstarted in his previous writings, are phenomenal yet again. The story starts on a high note , the first few pages are engaging, well written and then the angst peters down to an abrupt ending ...the reader is left hanging loose...akin to a film which lacks editing and a good connect between the scenes. The poems tell engaging stories replete with insights and keen observations from life. The 'hand' on the cover is spooky though the background landscape is evocative.